It is no secret that tobacco use is harmful. Despite our knowledge of the multitude of cancer causing agents and toxins in tobacco, people still use it. One tobacco product that seems to get a free pass in rural areas is smokeless tobacco (dip/chew/snus). It seems that people have the opinion that it only harms the user and, since there is no smoke, using it in public or at youth functions is not as much of an issue as smoking or vaping might be. It is important to correct that belief as it is untrue. 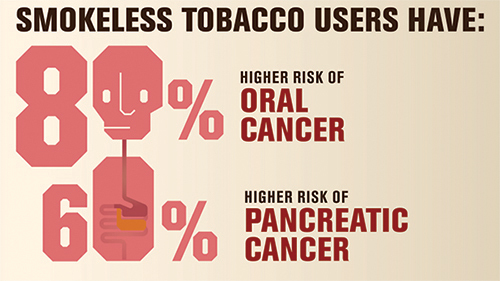 Smokeless tobacco use can increase the risk of oral cancer by 80% and pancreatic cancer by 60%. 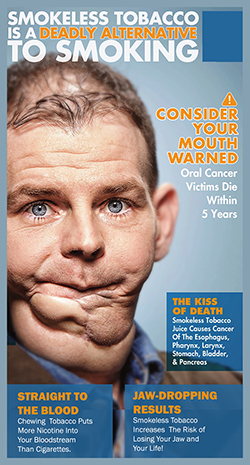 According to the Centers for Disease Control, there are at least 28 cancer causing agents in smokeless tobacco. 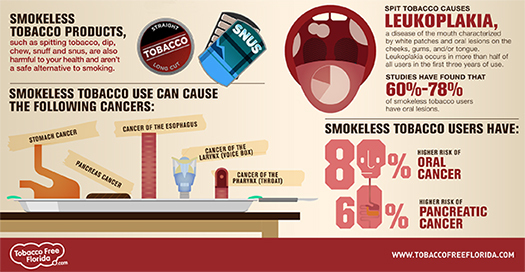 Since smokeless tobacco is actually “spit” tobacco, no one can really say it only impacts the user. It impacts the people around the user as well as the environment. Gilchrist County Students Working Against Tobacco (SWAT) Members Have a Busy Autumn! This has been a busy quarter for Gilchrist County SWAT. At the beginning of November, two SWAT youth from Trenton and Bell participated in a regional training event that brought youth together from North East Florida to discuss many tobacco issues such as e-cigarettes and youth tobacco use, as well as learning important skills like public speaking. SWAT youth also learned some of the key aspects of advocacy such as learning how to educate and speak with knowledge on tobacco topics that impact themselves and their peers in the community. The regional event was held to help SWAT youth connect with other SWAT clubs around the state and bring back the latest information and ideas to Gilchrist County. The Gilchrist Tobacco Free Partnership and encouraged local employers to recognize the Great American Smoke Out (GASO) at their workplaces this year. Palms Medical offices in Trenton, Gilchrist County, and Best Drugs all participated in the observance this year. Each employer gave out palm cards with information on the cost of smoking, and how much money tobacco users would save if they kicked the habit. Cessation information was also provided as part of the Great American Smoke Out observance in Gilchrist County. The Great American Smoke Out is a national day created by the American Cancer Society to encourage people to quit smoking. Tobacco use is the number one cause of premature death in the United States, killing approximately 500,000 people each year. This number includes about 10% of people who are not smokers themselves, but are people who live with smokers and are harmed by inhaling secondhand smoke. 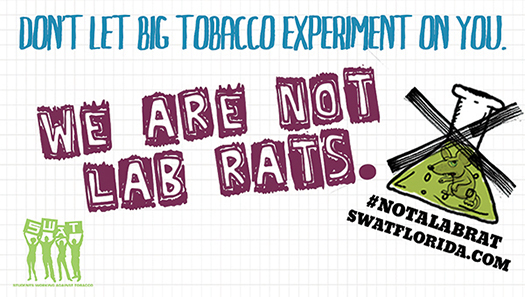 Students Working Against Tobacco Will be Telling the Vaping Industry that They are "Not a Lab Rats"! Students Working Against Tobacco clubs are established to give young people in Gilchrist County the opportunity to speak out in the community to let people know the ways in which tobacco companies target them and their friends to become replacement customers for the 430,000 people who die from tobacco related illness each year. SWAT youth take this message seriously since approximately 90% of all smokers report that they started smoking before the age of 18. These youth are dedicated to educating and advocating for policies that will help other youth stay tobacco-free for life. The new school year is just starting for 2018-2019. It is a busy and exciting time as students move up to the next grade level, or start school for the first time. Busses, minivans, and groups of students walking together all converge upon the schools with great energy and excitement about what potential this new school year has in store. 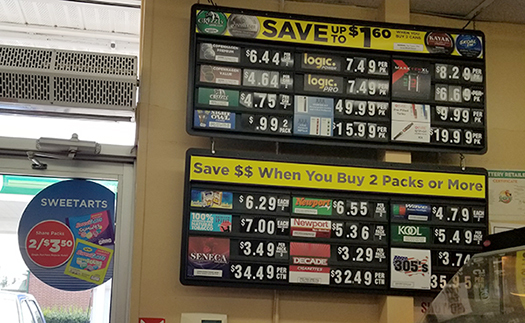 As the busses, minivans, and groups of students make their way to the school, however, they are all passing tobacco advertisements at local retailers. They see advertisements with price promotions, or maybe even new electronic smoking gadgets like e-cigarettes or vapes. So, while they are going to school to learn lifelong lessons that will serve them into adulthood, are they also being influenced on the way to and from school to pick up a habit that will last them into adulthood? If there is one thing we’ve learned from tobacco company internal memos it is that they have their eyes on our youth as their next group of customers. When Congress gained access to internal tobacco company memos, we found out for sure that added flavors like cherry and honey, colors, and even branding were all geared to attract the attention of kids. In our last article in the e-cigarette series, the chemicals in e-cigarette emissions were discussed. Now that we have evidence that nicotine and other chemicals are present in e-cigarette aerosol emissions, it’s time to focus attention on a specific ingredient in e-cigarette liquid – flavorings. When e-cigarettes first came on the scene, it didn’t take long to see that highly flavored liquids were a main ingredient in the e-juice that is turned into the aerosol that users inhale and then exhale into the environment. There are so many flavors available through hundreds of different manufacturers and retailers. It is hard to know how many flavors there really are. One study estimates more than 8,000 different flavors are sold in the United States (Kaur, Muthumalage & Rahman, 2018). Since 2009 it has been illegal for these flavorings to be added to traditional cigarettes, but they are still available in e-cigarettes. There was concern when e-cigarettes first came out about so many flavored e-cigarettes available because they would be attractive to kids. E-cigarette advocates often tried to refute that objection with the statement that adults like flavors, also. Do youth start using e-cigarettes because of the flavors that are available? According to recent research, the answer may be “yes”. In fact, among Texas youth (ages 12-17), 72.9% of those who use e-cigarettes said they started using them because “They come in flavors I like” (Harrell et al., 2017). Among youth (ages 12-17) who are current e-cigarette users, 98.6% said they used flavored e-cigarettes the first time they tried them (Harrell et al., 2017). Among adults nationwide (age 30+) who were surveyed, just 44.1% said they used e-cigarettes in a flavor other than tobacco-flavor the first time they tried them (Harrell et al., 2017). What is the FDA doing about flavored e-cigarettes now? Gilchrist County Celebrates the 10th Annual Tobacco Free Florida Week! The week of April 2nd-8th was the 10th annual Tobacco Free Florida Week. It was during this week that Tobacco Free Florida reached out to Floridians to encourage them to be tobacco free. Several locations around the community participated in Tobacco Free Florida Week outreach including the Trenton Library, Best Drugs and Palms Medical Offices in Trenton. Each of these locations posted information about Tobacco Free Florida Week which included information about how to quit for free. When e-cigarettes came on the scene a few years ago, it was like the Wild West where few regulations existed and companies could make just about any claim they wanted about the products. Manufacturers essentially mislead the public by declaring them to be safe, non-toxic, and a tobacco cessation device. So, let’s address some of the “lies and myths” surrounding e-cigarettes by seeing what researchers have learned. 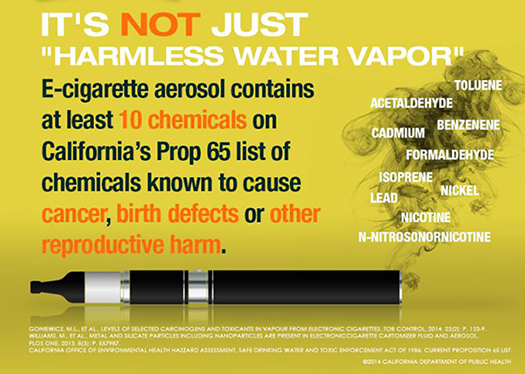 I heard e-cigarettes are safe, “water vapor”. 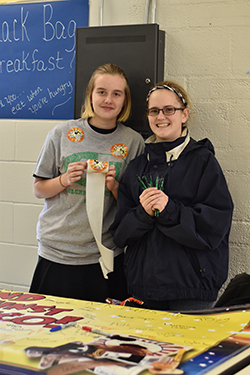 Members of the three Gilchrist County SWAT 4-H clubs participated in Through With Chew Week activities on Wednesday, February 21st. 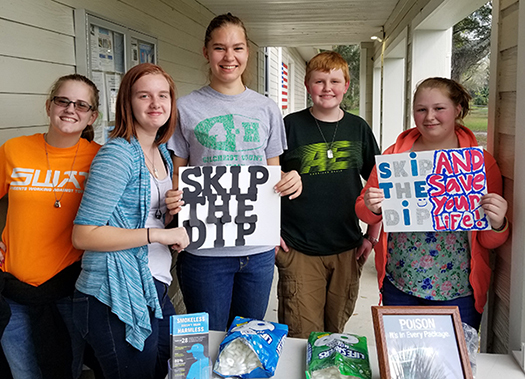 At Trenton and Bell High Schools, SWAT club members created a poster campaign by displaying posters with messages like “Skip the Dip”, “Through With Chew”, and “Skip the Dip and Save Your Lips”. These posters were intended to create tobacco-free messaging in the schools, as well as influence social norms of their peers. This is important because in Gilchrist County, 19% of all high school students have tried smokeless tobacco, and 10.5% are current, regular users of smokeless tobacco products according to the 2016 Florida Youth Tobacco Survey results. Meet the Leaders of the Gilchrist County Students Working Against Tobacco (SWAT) Chapter! We recently sat down and spoke with our chapter SWAT president, Hannah Turner, and our chapter vice president, Daica Putman to discuss Students Working Against Tobacco. Hannah and Daica are our Gilchrist County representatives to our state and regional SWAT meetings, and it is their responsibility to bring the regional and statewide initiatives back to Gilchrist so that they can help end tobacco use. Q: How long have you been a SWAT member, and why did you join? A: I have been a SWAT member for five years, since I was in 7th grade. I joined because both of my older siblings were involved in SWAT, and also because cigarette smoking is annoying to deal with in public places. Also, family members have already died of cancer and smoking causes cancer. Q: What are the benefits of being a county representative at regional SWAT meetings? A: It’s really interesting because I get to see what other people in other counties are doing in their SWAT programs, and I get to share what is happening in my own program. I also get ideas on what we can do in our own county. Q: What ideas or activities have you learned at a regional SWAT meeting that you would like to bring back to Gilchrist County? A: The coolest activity was a team building activity that had us really rely on others. We had to help our team make our way through a course together. Q: What would you like to accomplish in SWAT by the end of this school year? It is no secret that tobacco use is harmful. Despite our knowledge of the multitude of carcinogens and toxins in tobacco, people still use it during work hours. According to the Center for Disease control, tobacco use in the workplace accounts for the most lost worker productivity compared to other causes such as family emergencies or alcohol abuse(1). 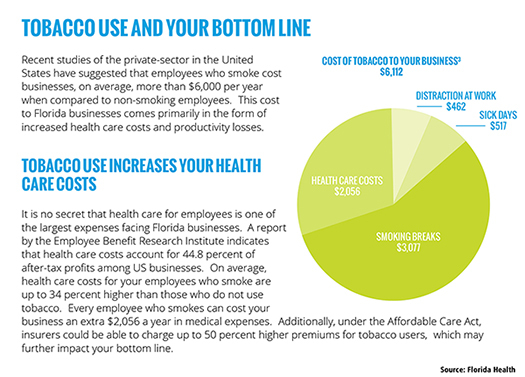 Tobacco use and recreational nicotine use via e-cigarettes at work can cost employers money. 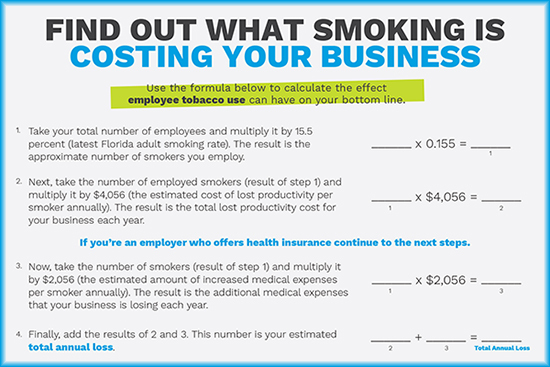 The loss of productivity for a business with smokers is estimated to cost $4,056 in productivity and $2,056 in medical costs per year(2). Additionally, unless an employer creates a tobacco-free policy for the workplace that includes e-cigarettes and vapor products, employees may be able to use their recreational nicotine devices at work. Some counties and municipalities have laws regulating these products, but Florida does not restrict their use indoors. 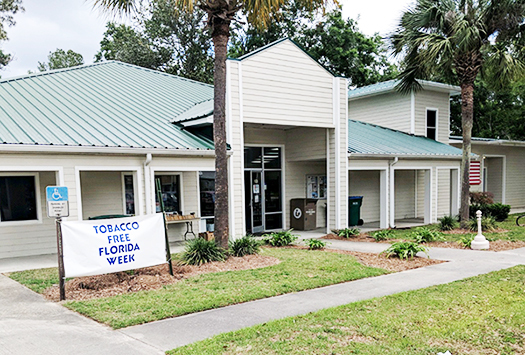 Trenton, Florida – A growing trend finds workplaces making big strides in supporting the health and well-being of their employees by adopting tobacco free workplaces and providing cessation resources to employees who use tobacco. Locally, a good example in the county would be the Gilchrist County School District, which provides a tobacco free workplace, and supports their employees’ efforts to quit smoking by providing cessation resources to their employees. They are also able to use insurance benefits for cessation support such as nicotine replacement medications and doctor’s visits for support. 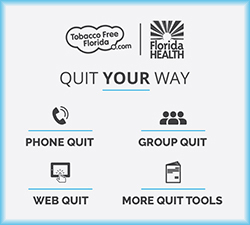 Additionally, the district has advertised the Quit Your Way program, offered by Tobacco Free Florida, to employees to further encourage the benefits of a tobacco free lifestyle. It is well known that tobacco companies market heavily in Florida and the United States. In fact, tobacco companies spent over $8 billion dollars marketing cigarettes in 2014 alone. Florida is one of the states where tobacco targets the largest amount of marketing dollars. Cigarettes aren’t the only thing marketed to us, either. Smokeless tobacco companies spent about $600 million dollars in marketing products in 2014. In addition to the vast quantities of money spent by tobacco companies to advertise their products here on the local level, they study certain “markets”, or groups of people, to figure out what kinds of messages will sell their products. In rural areas, tobacco companies use a variety of marketing messages. Some of the most popular are using camo, outdoor imagery, or some kind of rugged image such as the Marlboro Man. This is because tobacco companies actually study people in different groups. They want to know what kinds of things appeal to us so they can tailor their advertising toward the target audience. One of the target groups for tobacco companies is people living in rural areas, especially people who like to hunt, fish, and even farmers. The themes used in tobacco advertisements geared toward rural residents have centered around the idea of being rugged, or tying the act of smoking or dipping as part of the outdoor experience. 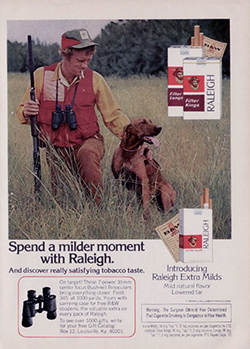 Tobacco ads from the past reinforced the idea of smoking while hunting, for example, by showing a bird hunter with his German Shorthair Pointer and using terms such as “mild experience”. Another former cigarette ad shows a sportsman holding a fishing rod while smoking. 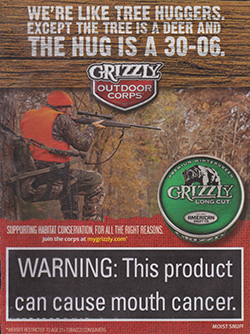 The words used in the ad included “swagger”, “distinctive” and “alert”. 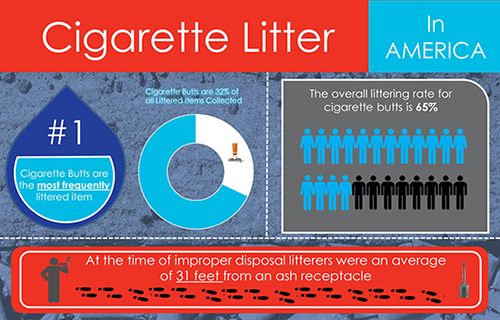 This paints a favorable picture to sportsmen about smoking in connection to fishing. Everyone remembers the Marlboro Man who was used to portray smoking as a strong, rugged activity that would make men appear to be like him. A new slate of Advisory Council members was elected to lead the tobacco prevention outreach of the Tobacco Free Partnership of Gilchrist at the latest quarterly meeting. The newest member of the Advisory Council is Susan Gibb. Susan is the School Health Coordinator for the Gilchrist County Health Department. She has been a Registered Nurse for 42 years and has worked in public health, women’s health and pediatrics. smoking and secondhand smoke on both adults and children. The Partnership is pleased to welcome Susan to the Advisory Council and they look forward to working with her to improve the health of community members while working toward tobacco-free social norms. Everyone knows there is no smoking allowed in most public buildings in Florida thanks to the Florida Clean Indoor Air Act (FCIAA). This is a great thing for the more than 80% of us to do not smoke or use other forms of tobacco because we are protected from breathing secondhand smoke in places like malls, restaurants, and theaters. Thanks to our FCIAA, our children will never have the experience of having to choose a “smoking” or “non-smoking” area in a restaurant, or be exposed to cigarette smoke in almost any public indoor environment the way that we did when we were children. However, while the Florida Clean Indoor Air Act restricts smoking in most public indoor spaces, it does not allow municipalities or counties to create outdoor clean air policies such as beaches or parks due to a provision in the law called preemption which only allows state lawmakers to create such policies. Floridians are becoming increasingly tobacco free, as even the youth cigarette smoking rate is lower than most states in the county. 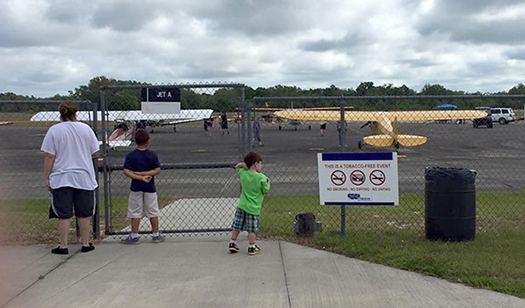 As a result of individuals and families wanting tobacco free outdoor entertainment, there is an exciting trend happening at North Central Florida – tobacco free festivals and events. Event and festival tobacco free policies are completely allowed as the FCIAA only preempts a municipal or county ordinance regarding clean outdoor air. Therefore, many local community festivals and observances are going tobacco free! Tobacco Free Florida Week Focuses on "The Cost of Smoking"! Tobacco Free Florida Week was held during the week of May 7th this year. The theme was “The Cost of Smoking.” Most people know that smoking is not healthy. Did you know that smokers die an average of 10 years earlier than nonsmokers? In Florida, 30% of all cancer deaths are due to smoking. Some smokers live with chronic conditions such as chronic obstructive pulmonary disease (COPD), or another smoking related illness that reduces the quality of life for those individuals. Electronic cigarettes, or e-cigarettes, are fast becoming a threat to the historically low use of tobacco products among Florida youth. The e-cigarette was invented in 2004, making it a fairly new product on the market which has just recently come under state and federal regulations. For over a decade e-cigarettes and other nicotine vaporizer products were on the market before any substantial regulations were enacted, including the way e-cigarettes were advertised. Florida law officially banned the sale of e-cigarettes to minors starting on July 1, 2014 and the Food and Drug Administration (FDA) initiated deeming regulations in 2016. However, in the absence of marketing regulations, e-cigarette companies wasted no time following in the footsteps of traditional Big Tobacco, marketing by advertising their products in ways that especially appeal to youth. Flavors and colors were added to attract younger users. Music festivals, concerts and other events were sponsored by e-cigarette companies. Television and radio commercials, which are off-limits for traditional tobacco products, were used to send the message that e-cigarettes provide a cool, hip way for young people to “be free” or be more “adult”. Apparently, young people were paying attention to these e-cigarette advertising campaigns. The 2016 Florida Youth Tobacco Survey (FYTS) results have been released and the data indicate a substantial increase in the number of young people who use e-cigarettes in our state. According to the 2016 survey results, 6.4% of middle school students are current e-cigarette users and 18% of high school students are current e-cigarette users. The first year e-cigarette use was measured by the FYTS was 2012. Between 2012-2016, the percent change in e-cigarette use by middle school student was 300% and the percent change for high school students was 445.5%. The number of young Floridians using e-cigarettes continues to rise each year and the number is now more than three times higher than the number of youth who smoke traditional cigarettes. Gilchrist County Students Working Against Tobacco (SWAT) Celebrate Kick Butts Day! March has been a busy month for Gilchrist County SWAT. Kick Butts Day was celebrated this month, which is a national observance held by youth around the entire country to bring focus in their local communities about the ways tobacco companies intentionally target young people through point-of-purchase advertising and other marketing techniques designed to encourage youth initiation of tobacco products. Trenton, Fla. – QuitDoc Foundation and the Florida Department of Health’s Tobacco Free Florida program are raising awareness about the dangers of smokeless tobacco – like chew and dip – during Through With Chew Week. This national public awareness campaign was created to reduce the use of smokeless tobacco among young people, and Tobacco Free Florida aims to help combat this deadly addiction. Through With Chew Week takes place Feb. 19-25, with the Great American Spit Out – a day when smokeless tobacco users join together to quit – on Feb. 23. 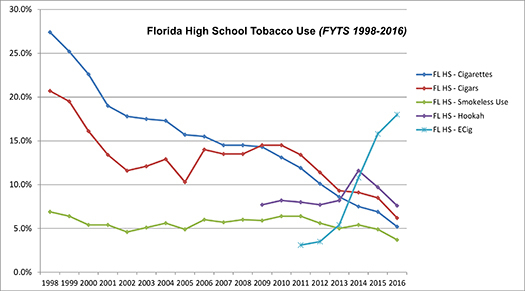 Although the youth cigarette smoking rate in Florida decreased over 50 percent between 2012 and 2016, the number of Florida high school students who reported current use of smokeless tobacco products decreased only 24.5 percent in those same four years. The disproportionately higher rate of smokeless tobacco use in rural areas is also alarming – current youth smokeless tobacco use is more than three times higher in rural communities than in non-rural areas. 8.4% of youth ages 11-17 in Gilchrist County reported current use of smokeless tobacco products in 2016, according to the Florida Youth Tobacco Survey. The Tobacco Free Partnership has been working hard in the community over the past few months. In November, members participated in the Suwannee River Clean Up which was organized through the Gilchrist County Chamber of Commerce. After reading a recent article on the negative environmental impact of tobacco waste in the QuitDoc Foundation quarterly newsletter, the Partnership was invited to participate in the event to educate community members about the issue as well as to clean up the tobacco waste. 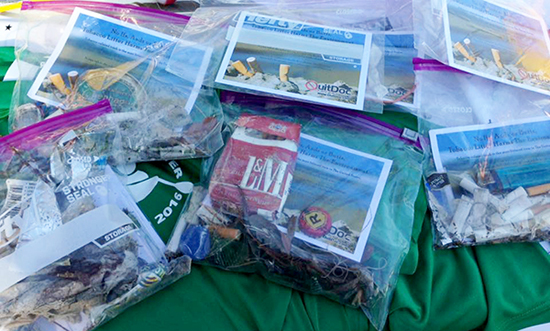 Along with other clean-up gear such as gloves, participants were asked to place tobacco trash in disposable quart-sized bags which included facts about tobacco waste being the number one pollution on beaches and waterways around the world. WHO/WHAT: In observance of the Great American Smokeout, sponsored by the American Cancer Society, Tobacco Free Florida and the Tobacco Free Partnership of Gilchrist County encourage tobacco users to use the day to make a quit plan or to plan in advance to quit smoking on that day – November 17, 2016. Students Working Against Tobacco (SWAT) members take their mission to save their generation from tobacco use very seriously. Not even the first hurricane to hit the State of Florida in a decade could dampen their resolve to be the voice of youth working against the influence of Big Tobacco. Youth in the region were all set to gather together to commit themselves to regional and local plans to engage peers and community members to take a stand against tobacco when Hurricane Matthew appeared in the Atlantic. Although their meeting had to be postponed, not even the winds of a hurricane stopped their determination to work together to impact their communities for change. The Tobacco Free Partnership of Gilchrist County recently held a meeting where a new Advisory Council was elected which includes two adult members, a young adult college student, and a member of Students Working Against Tobacco. The youth members are both returning Advisory Council members, Joshua Akin who is a Santa Fe College student, and Kalin Siegel who is a member of SWAT and a high school student. Other members include a returning member, Jamie Hinote, who is the Outreach and Eligibility Specialist for Palms Medical Group. She also leads the local tobacco cessation groups in association with Suwannee River AHEC which are held at Palms Medical’s Trenton Office. A new Advisory Council member is Debbie Destin who is very active in the community. Ms. Destin owns Destin’s Dance and Fitness Academy in Bell, Florida. 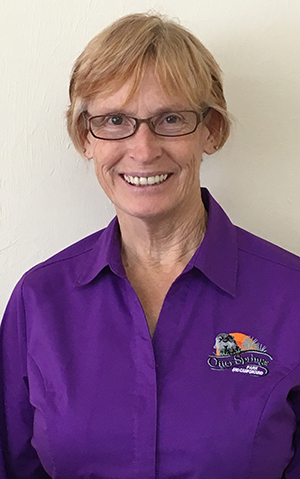 She is also the Events and Activities Director for ForVets which is a Veterans organization that operates Otter Springs in Gilchrist County. Each member of the Tobacco Free Partnership Advisory Council brings unique talents and abilities to the group, as well as a passion for making Gilchrist County a healthier place by reducing the impact of tobacco use on youth and adults in the community. Two of our SWAT club alumni are also returning members of the Tobacco Free Partnership: Joshua Akin and Cheyenne Siegel. They bring years of experience in public speaking, leadership activities, and an understanding of how tobacco exposure and advertising impacts young people in Gilchrist County. As school comes to an end and graduations are held across the county, it is time for us to say goodbye to one of our hardest working SWAT members, Joshua Akin, as he finishes his high school career. Joshua was in 7th grade when he joined the Trenton SWAT club making him one of the longest serving SWAT members in Gilchrist County. Joshua has served in several leadership positions as a SWAT member, including acting as our county representative to regional SWAT meetings. He was part of the SWAT youth delegation that helped celebrate the smoke-free stands at the Daytona Speedway and represented Gilchrist County SWAT at the event. He was the Vice President of the Trenton SWAT club, and also served on the Tobacco Free Partnership of Gilchrist County for several years as an Advisory Council member. In addition to his leadership activities, Joshua spent many hours during his SWAT club membership working with local, state, and national leaders. Locally, Joshua was proud to be an integral part of working with the cities of Trenton and Fanning Springs and the Town of Bell to pass flavored tobacco resolutions in each municipality. Never one to back away from a public speaking opportunity, Joshua even presented to his school board about current issues with tobacco and youth, and asked them to consider strengthening their tobacco policy. Although they didn’t change the policy that day, a few months later tobacco use and possession were added as a higher level offenses, and e-cigarettes were included as tobacco in school policy. 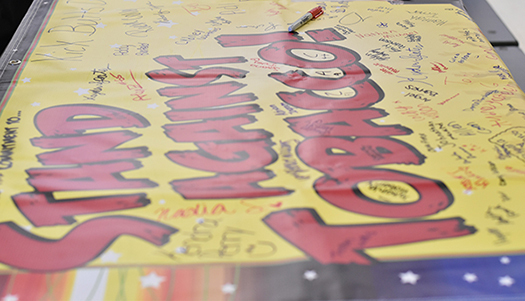 The week of May 8-14 marked the annual celebration of Tobacco Free Florida Week throughout the state. Members of the Tobacco Free Partnership of Gilchrist County (TFP) worked to make sure that as many community members as possible were reached. This year’s message focused on the dangers of secondhand smoke, and the fact that there is no safe level of exposure to secondhand smoke. The Bureau of Tobacco Free Florida designed a poster campaign to highlight this message, and it was especially aimed at encouraging Floridians to not smoke around children. 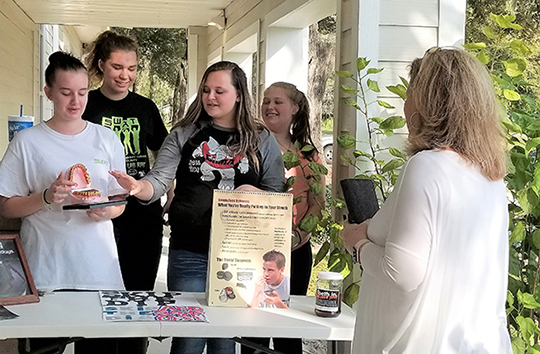 In addition, Bell Middle School SWAT 4-H club members held an afternoon event to educate their peers about secondhand smoke, and the Gilchrist County Chamber of Commerce connected members who wanted to participate via the weekly newsletter. Trenton, Fla. – The Florida Department of Health’s Tobacco Free Florida program and QuitDoc Foundation are launching a new initiative, Secondhand Smoke Exposed, as part of the eighth annual Tobacco Free Florida Week, taking place May 8-14, to educate Gilchrist County residents about the dangers of secondhand smoke. 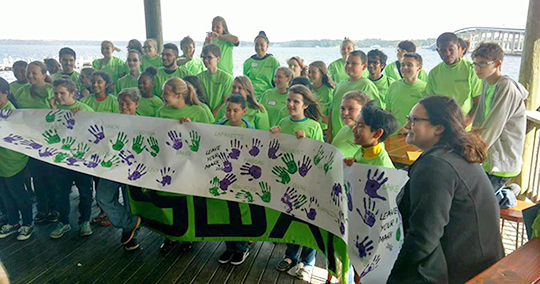 BELL, Fla. – Gilchrist County’s Students Working Against Tobacco (SWAT) spoke up and took action against the tobacco industry for the 21st annual Kick Butts Day on March 16. This national day of activism, sponsored by the Campaign for Tobacco-Free Kids, empowers youth to fight back against Big Tobacco. Trenton, Fla. – QuitDoc Foundation and the Florida Department of Health’s Bureau of Tobacco Free Florida are raising awareness about the dangers of smokeless tobacco, like chew and dip, during “Through With Chew Week.” This public awareness campaign was created to reduce the use of smokeless tobacco among young people and help combat this deadly addiction. “Through With Chew Week” takes place Feb. 14-20. To raise awareness about the dangers of smokeless tobacco use, Gilchrist County SWAT members will be collecting signatures in support of creating tobacco-free community events during Through With Chew Week, in various locations. Although youth cigarette smoking rates in Florida are at an all-time low, 12.2 percent of high school students in Gilchrist reported current use of smokeless tobacco products in 2014, according to the Florida Youth Tobacco Survey. This is significantly higher than the state average of 5.4 percent. The Tobacco Free Partnership of Gilchrist County recently elected new Advisory Council members including two youth members and two adult members to lead the tobacco prevention outreach of the group in Gilchrist County. Kalin Siegel is a freshman who takes classes at Florida Virtual School and has been a SWAT member for three years. Kalin has also been an active 4-H member since elementary school. She became involved in community activities to help keep youth in Gilchrist County from starting to use tobacco through the SWAT 4-H Club, and serves as the Gilchrist County SWAT representative to regional and state meetings. She also advocated for flavored tobacco resolutions in Bell and Trenton, and spoke to the Town Council and City Commission about the issue. People want a clean environment including clean air, water, and safe food to eat. This is especially important for children as they are growing. We know that secondhand smoke is unhealthy, but do we really think about what it might be doing to kids who are around it? Did you know that babies who are around cigarette smoke have a higher chance of dying of Sudden Infant Death Syndrome (SIDS)? The CDC reports that 400 babies die as a result of SIDS connected to secondhand smoke every year (CDC, 2015). This is a tragedy that may be avoided by encouraging new parents not to smoke around kids. Creating Tobacco-Free Environments is Good for Kids! Have you ever been enjoying an outdoor event only to have cigarette smoke or e-cigarette vapor blown into your face? Even distant smoke can make its way into your vicinity, causing irritation or even causing negative health effects according to the U.S. Surgeon General. How do you feel about stepping in tobacco spit, or seeing a bottle full of tobacco spit used by someone who is dipping? My great-grandfather was a tobacco farmer. My grandfather was also a tobacco farmer. My father was born and raised on my grandfather’s farm where the tobacco was grown and harvested. Tobacco has always been part of our family culture. In fact, as a child I saw that every adult in my family smoked, or was a former smoker. Car rides and family gatherings were smoke-filled affairs. Tobacco was a way of life for my family, and still is for many of my relatives. Tobacco is culturally accepted in many rural locations, just as in my family, especially in communities where tobacco is grown. 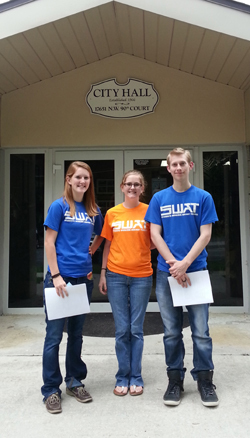 SWAT members from Gilchrist County spoke to the Fanning Springs City Commission on June 2, 2015. They are concerned about the high number of students in their schools who use flavored products when they use tobacco for the first time. This is the fourth presentation SWAT has made in Gilchrist County on this topic. They have also presented at the Gilchrist County Board of County Commission, Bell Town Council, and the Trenton City Commission. Our SWAT club feels that flavored tobacco use by youth is a big problem in Gilchrist County and we wanted to take action in changing this. Based on the 2012 Florida Youth Tobacco Survey, in Gilchrist county 32% of all high school students have tried flavored cigars, and 14.4% of all high school students in Gilchrist County are regular flavored cigar smokers. 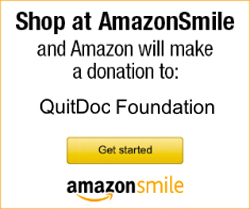 Quit Doc Research and Education Foundation (QuitDoc) has once again been awarded a grant from the State of Florida Department of Health to continue to provide tobacco awareness and prevention programs throughout Gilchrist County. The programs are designed to reduce the number of teenagers who start smoking each year, to decrease the number of tobacco related deaths, and to provide information on appropriate methods to quit smoking. The county level data from the 2014 Florida Youth Tobacco Survey (FYTS) were published and there is a lot to celebrate among Gilchrist County Tobacco Free Partnership members, SWAT members, and community partners who support the tobacco prevention program. Quit Doc first received the tobacco prevention grant in 2008 after the FYTS was given to county high school students. Unfortunately, the middle school students did not participate in the 2008 survey, but we can measure our progress among middle school youth starting with the 2010 FYTS. The Tobacco Free Partnership of Gilchrist County and Students Working Against Tobacco (SWAT) sponsored Great American Smoke Out (GASO) events at Hobo's Restaurant in Trenton and Palms Medical offices in Trenton and Bell. The Great American Smoke Out is a national day created by the American Cancer Society to encourage people to quit smoking. Gilchrist County SWAT youth have been active in the past few months by educating local community members about the problem of point of sale advertising geared toward youth, and by starting two new school SWAT clubs at Trenton High School. The Tobacco Free Partnership of Gilchrist County recently elected new Advisory Council members including two new youth members. These young people are part of the Students Working Against Tobacco leadership club, and will be helping start a new high school SWAT club at Trenton High School. According to the latest Florida Youth Tobacco Survey, students in Gilchrist County use all forms of tobacco including cigarettes, smokeless products, and cigars at higher levels than their peers across the state. When Gilchrist County high school students were asked if they have ever tried alternative products such as flavored cigars, snus, and e-cigarettes, the results also showed that Gilchrist students try these products at higher rates than other youth around the state. Bell, FL – Smoke-free multiunit housing, a growing trend throughout the country, has made its way to Bell, Florida. “Lots of clients don’t want to consider living in a house that has been smoked in because of the major clean-up involved in removing the smell and residue,” said Natalie Rankin of Hometown Realty. Hometown Realty manages tri-plex rentals, and rental homes located in the Rolling Hills subdivision. 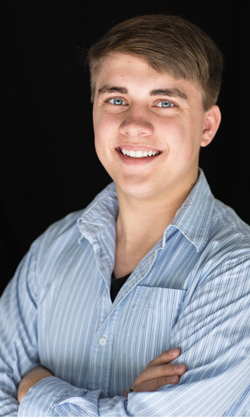 WASHINGTON, D.C. – Chandler Ash, 17, of Archer, Fla., has been named the South Region Youth Advocate of the Year by the Campaign for Tobacco-Free Kids for his leadership in the fight against tobacco. Chandler will be honored at a gala in the nation’s capital on Thursday (May 15) along with a national winner, three other U.S. regional winners and a group winner. Chandler is a senior and is homeschooled. He first got involved in fighting tobacco in middle school through Students Working Against Tobacco (SWAT) after watching his grandfather struggle with tobacco addiction. The tobacco industry is losing customers. 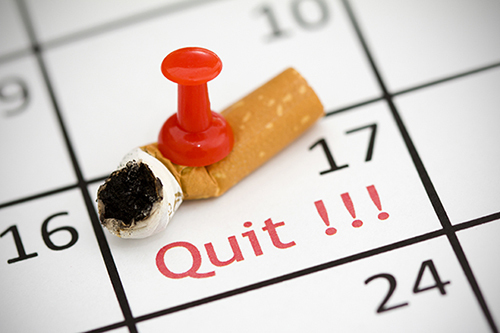 Not only are more smokers quitting, every day an estimated 1,315 people in the United States die because of smoking. On Kick Butts Day, Students Working Against Tobacco (SWAT) Clubs throughout Florida spoke up and took action to let Big Tobacco know they will be not replacements. Kick Butts Day, which this year was celebrated on March 19, is the Campaign for Tobacco-Free Kids national day of activism that empowers youth to fight back against Big Tobacco. It is no secret that tobacco use is harmful to human health. Even elementary age children I speak with tell me that smoking or dipping is a bad habit, or that it will hurt people. Despite the fact that even our youngest citizens know that using tobacco is harmful, it is still a practice that occurs even during work hours. According to the Center for Disease Control (CDC), tobacco use in the workplace actually accounts for the most lost worker productivity compared to other causes such as family emergencies or alcohol abuse (1). Since most smokers want to quit, up to 70% according to the CDC, workplaces that create a smoke-free campus policy could actually be doing their employees a favor in helping them become tobacco-free(2). Gilchrist County Student Working Against Tobacco Youth Engage the Community During a Very Busy Fall! 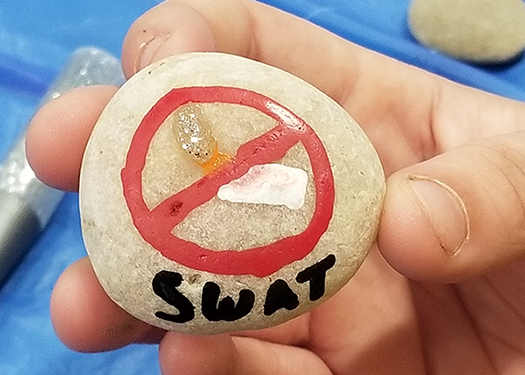 The Gilchrist County Students Working Against Tobacco (SWAT) youth have been busy with community outreach activities in the past several months. 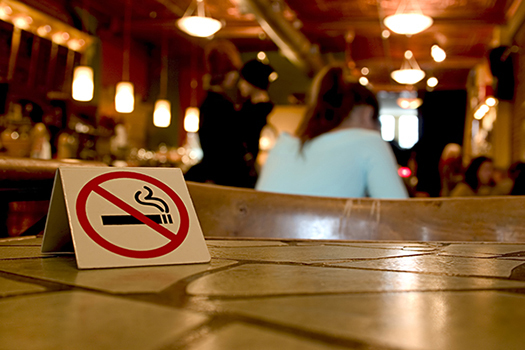 Secondhand smoke is a well-known health hazard, and many businesses and community organizations have created smoke-free zones to protect customers and children from the negative health impacts associated with secondhand smoke exposure. It’s the start of a new year for the Gilchrist 4-H Students Working Against Tobacco (SWAT) club, and they already have big things planned. In the past, they have been extremely successful in reaching out to the community and to decision makers about tobacco related issues. This year, Gilchrist SWAT plans to do even better. Students from six counties in North Central Florida joined forces to write and produce "Who is the Target", a short film that focuses on the use of flavored products as a youth marketing strategy by tobacco companies. Fourteen Students from Alachua, Clay, Dixie, Gilchrist, Levy, and Marion Counties were asked to contribute facts and information on the issue of flavored tobacco products that are not currently regulated by the Food and Drug Administration. The students then recorded the information at a make-shift studio. March has been a busy month for Gilchrist County SWAT. Gilchrist County SWAT youth Chandler Ash and Tucker McDaniel met with Congressman and Senate candidate Connie Mack IV during his stop in Bell, FL.